Whew. You guys. Our weekend. Was insane. I’ll have to tell you more about it later, but it’s rather emotional what with all the reminiscing, about the tragedy of September 11, about high school at my ten year reunion, and about my grandpa’s life, as he was quite ill over the weekend, and I thought I would have time to write a post earlier over the weekend, but I didn’t, because of the insanity and reminiscing, so here I am late at night before leaving town again early in the morning but I want to write a blog post because, apparently, it is the reason my mother gets out of bed in the morning. This calls for a quick meal, right? Bonus points for comfort food! In that case, spaghetti carbonara is the ticket. My mom has been craving it, and I can’t blame her. 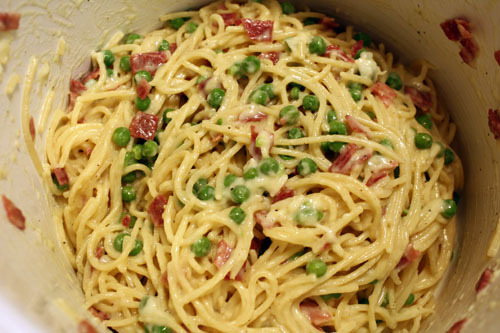 Spaghetti carbonara, which is noodles in a creamy parmesan sauce with bacon, is one of my favorite meals. But alas, she does not know how to make it. 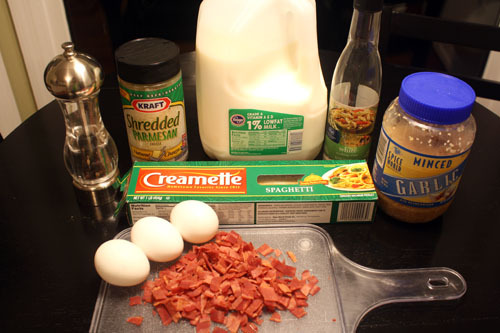 Over a few years, I’ve figured out the best way to make carbonara as I like it, so I thought I’d share it with you today! It’s one of those dishes where the recipe is somewhat easy and flexible, but it sounds a little crazy until you make it and has some room for error in technique. 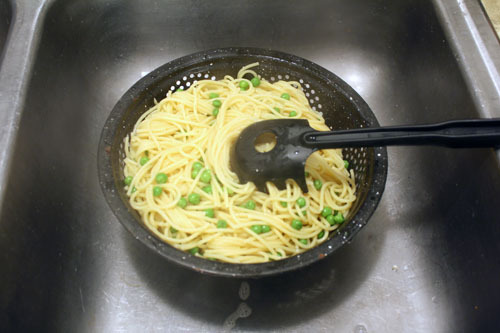 Fortunately, it’s a fairly cheap dish, and it only takes as long to make as boiling the pasta, so mistakes aren’t a complete disaster! Here’s what you need. 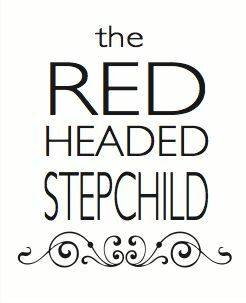 I bet you have most of it in your kitchen already! Spaghetti noodles (one pound of your favorite brand, or in our case, the brand that was on sale), a half cup each of milk, white wine, and shredded parmesan cheese (no shame in the green can), a few teaspoons or cloves of minced garlic, black pepper (to taste, but I like a lot – about a tablespoon), three eggs. and bacon. I used six slices of turkey bacon, microwaved and chopped it up in advance. 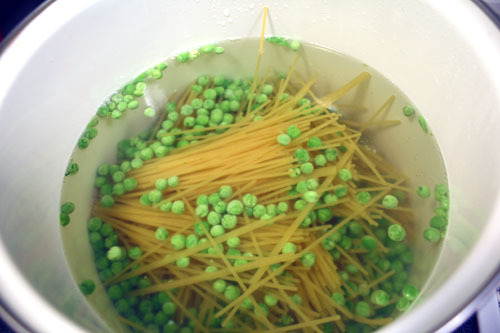 Start by boiling your spaghetti noodles in heavily salted water. Oh, and frozen peas! I forgot about the peas. 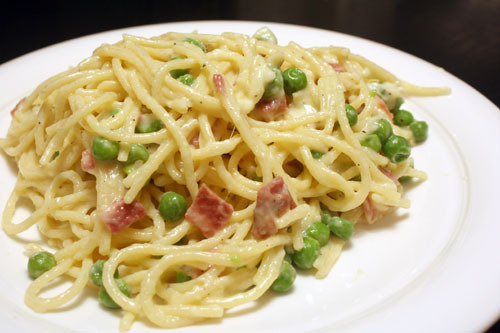 I doubt that peas are authentic in carbonara, but I like them in there. Plus they make it prettier! 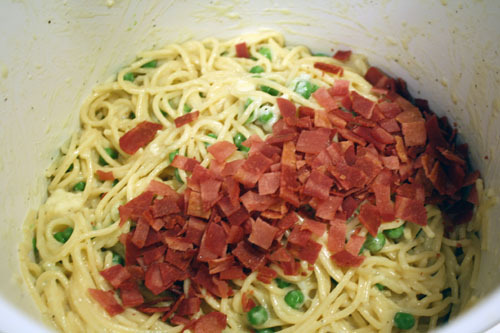 While the pasta and peas are boiling, mix up the delicious creamy sauce with all the remaining ingredients except the bacon. The bacon is not yet invited to the party. Trust me. Oh yeah, I may have added some extra mozzarella cheese. You expect no less from me, I am sure. Mix that up and set it aside. That’s right, aside. Yes, I know it has raw eggs in it. Yes, they will be cooked eventually. 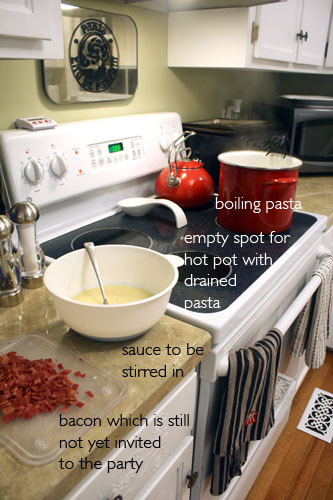 The idea is that you stir the sauce into the hot pasta, and that cooks the eggs. So you have to act fast so the pasta stays hot enough! While the pasta and peas finish boiling, I set up my kitchen to work quickly. Okay! 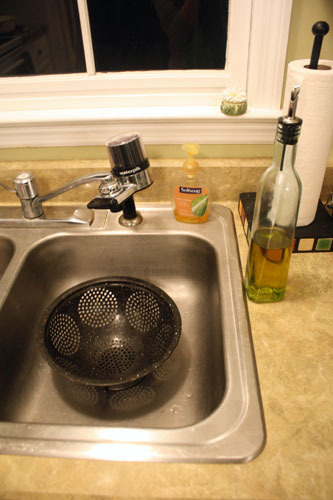 When the pasta’s done boiling, I drain it, drizzle some olive oil on it, and quickly toss it. Quickly! Like I should be doing that instead of taking pictures to show it to you! Then stir! Stir as you’re pouring in the sauce, stir once it’s in there. Stir stir stir. 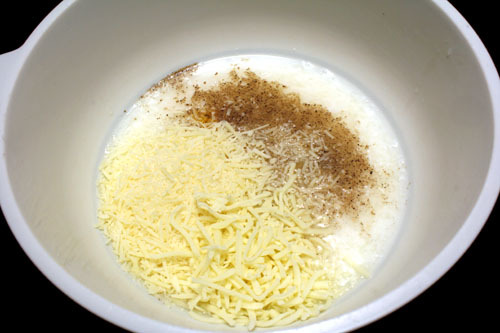 This, right now, is when you’re cooking the egg, and the more you stir, the creamier it will be. If you don’t stir, you’ll end up with clumps of cooked egg in your pasta, which is not the worst thing that could happen in the world, but still sort of gross. 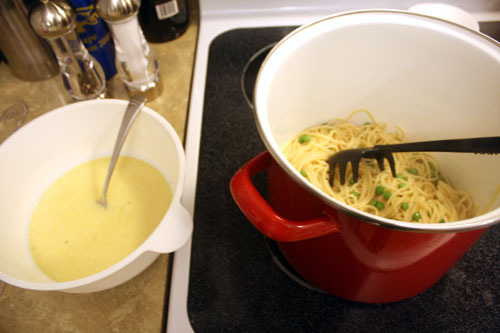 Stir it up until the sauce isn’t liquidy, but creamy and thickened. It can take a minute or two, but it’s done once it looks amazing like it does in the photo above. Oh my, that looks so tasty. But wait! Guess what time it is? I mean. I mean. Gracious. Spaghetti carbonara is endlessly forgiving, once you master the cooking-the-egg-with-hot-pasta part. The ratios for the sauce above are what I like - in general, three eggs to one pound pasta, equal parts milk, wine, and parmesan (maybe a little extra cheese because duh). 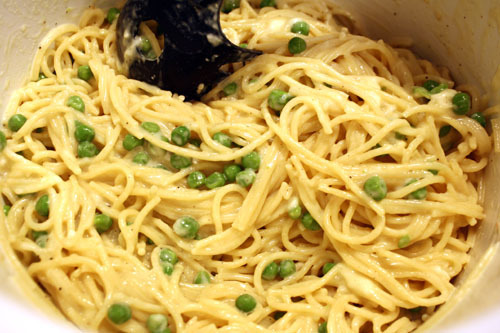 This is a great dish for using up eggs if needed, although four eggs per pound of pasta was a bit rich and too eggy for me. I like three, but you can try more or less. You may not want as much wine, or you may leave out the bacon to make it vegetarian, or you can double the cheese and sub in cream for the milk (in which case I would like to come over for dinner). It’s very accommodating to your tastes and whatever you have in your cupboard! The only downside to carbonara is that it doesn't reheat well. At least, it's nowhere near as creamy as when it's first prepared. You can scale it down if you're not sure about the leftovers, but I think it's delicious enough, even reheated, to make the full pound of pasta. This is one of my favorite meals – partly because it’s so easy, but also because it’s fantastically delicious. Enjoy! OH. OH this looks delicious!!! I am trying this wonderful recipe.